Beloved of the Gods brings together Australia’s most gifted musicians performing masterpieces by two divinely inspired composers, Wolfgang Amadeus Mozart and Felix Mendelssohn. 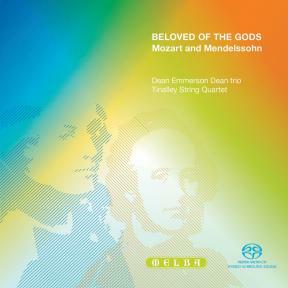 The Dean Emmerson Dean trio’s members, clarinettist Paul Dean, his brother violist Brett Dean and pianist Stephen Emmerson perform Mozart’s Trio for Clarinet, Viola and Piano in E flat major, K498 ‘Kegelstatt’ written by Mozart to be played with his close friends. The piece’s title ‘Kegelstatt’ refers to the “bowling alley” where Mozart spent happy hours playing the game “skittles” and composing in the days immediately prior to writing this Trio K498. The ebullient performance and high spirits of Emmerson and the Dean brothers during the making of this recording echoes Mozart’s joy in making music with close friends and congenial musicians. The Dean-Emmerson-Dean trio follows the ‘Kegelstatt’ trio with Stephen Emmerson’s Papamina Suite, an effervescent arrangement of music from Mozart’s The Magic Flute. Emmerson’s arrangement presents the ensemble with unique opportunities to break new ground in Mozart’s music.—from sublime arias to buffo duets to superbly re-imagined orchestral textures.. The brilliant young Tinalley String Quartet completes this SACD release with the Mendelssohn String Quartet No. 2 in A minor, Op.13, ‘Ist es wahr’ one of the central pieces in their winning performance at the Banff International Chamber Music Competition in 2007. Since 2003 the Tinalley String Quartet has rapidly achieved recognition as one of the most musically creative young quartets on the world chamber music stage. Their performance of the Mendelssohn quartet on this recording beautifully demonstrates the qualities to which enthusiasts and officianados are drawn in Tinalley’s performances. Their use of sonorities and articulation is remarkable with at one point the ensemble sounding like an accordion behind the solo fiddle, at another sounding like a symphony orchestra accompanying a sotto-voce recitative. From lyrical moments to thundering climaxes, Tinalley offers persuasive support for the proposition that the string quartet is the perfect ensemble. "Wolfgang Amadeus Mozart 1756–91) Trio for Clarinet, Viola and Piano in E flat major, K498, Kegelstatt 1786)"
"Felix Mendelssohn (1809–47) String Quartet No2 in A minor, Op13, Ist es wahr? (1827)"
This trio was one of three composed in 1786, an annus mirabilis, even by Mozart’s own standards, which also witnessed the creation of The Marriage of Figaro, K492, the Piano Concertos Nos 23–25, and the Symphony No.38 ‘Prague’, K504 among many other masterpieces. The two other trios are for the usual combination of violin, cello and piano (K496 in G, and K502 in B). This one, however, was written for the highly unusual combination of clarinet, viola and piano. The explanation lies in the fact that all three trios were occasional pieces composed for private performance by Mozart’s friends; here the intended performers were the clarinettist Anton Stadler (for whom Mozart would later compose his Clarinet Concerto, K622 and Quintet, K581), the pianist Franziska von Jacquin, who was studying with the composer, and Mozart himself on the viola. The nickname ‘Kegelstatt’, literally ‘Bowling Alley’, is derived from a contemporary, unverified, story that Mozart composed the work during a game of skittles. Whether true or not, the title is yet deceiving if it leads us to think the work itself is no more than a mere pleasant diversion. In fact it makes unusually virtuosic demands on all three performers and is pervaded by a delight in the most sophisticated forms of musical dialogue. It also displays an innovative approach to form, opening not with the customary allegro but with an expressive andante. This is followed not by a slow movement, but by a minuet and trio, and the work concludes with a rare seven-part rondo (AB AC AD A). Overall, Mozart seems less concerned with exploiting contrasts between movements than with conveying an all-pervading sense of delicacy and intimacy. Furthermore, the work may also have had Masonic overtones. Stadler, like Mozart, was a Mason, and the work is composed in E, a key Mozart would later use again for overtly Masonic works such as The Magic Flute, K620, and the Symphony No.39, K543. There may be no better symbolism for the bonds of brotherhood, however, than the equality of the partwork that Mozart weaves for his three musical protagonists. In this respect, the viola and clarinet were particularly well suited to their roles as mature conversationalists, sharing as they do similar ranges and distinctive tone colors. We might even think of them as characters in an untexted comic opera — such is the enchanted urbanity of this work, composed in the shadow of Figaro. Arrangements for chamber ensemble of operatic excerpts were very popular in the 18th century. Most operas, even if relatively successful, remained unpublished but people could become acquainted with the music through arrangements for a variety of ensembles such as string quartet, piano trio or wind octet. Such arrangements were widely published across Europe, as were reductions for piano or piano duet of most operas and large scale orchestral works throughout the 19th century. Mozart himself made various arrangements of music from many of his operas both to make his work more widely known and also to supplement his income. Essentially Mozart invented the chamber music combination of clarinet, viola and piano in his ‘Kegelstatt’ trio. It is no coincidence that this work shares the key of E with The Magic Flute as both works radiate a certain sense of nobility and warmth as well as humour. Though Mozart did not arrange other music for this combination, these were three of his favourite instruments. We like to think that, had Mozart lived longer — The Magic Flute was composed in the last year of his life, after all — he might have had the brilliant idea of arranging some of it for this combination himself. The Papamina Suite presents music primarily associated with two characters from The Magic Flute, Papageno and Pamina. Pamina is a noble princess in love with Prince Tamino. Papageno is but a simple and affable bird-man. Though they are at quite different ends of the social hierarchy, the charming interactions between these two characters are among the delights of the first Act. The Suite is in five main parts linked by a couple of short interludes. At the centre is the Act 1 duet ‘Bei Männern, welche Liebe fühlen’ between Pamina and Papageno. Despite their considerable differences in status and sophistication, the two characters nonetheless share this sublime duet on equal terms, a beautiful metaphor in itself. Here and elsewhere in the Suite the clarinet takes Pamina’s line, while the range and character of Papageno’s music seems to sit very nicely on the viola. On either side of this duet is an aria for each of these two characters on their respective instrument. Firstly comes Pamina’s ‘Ach, ich fühl’s’, one of the most glorious of all Mozart’s arias, which sounds no less sublime played on the clarinet. On the other side of the duet is Papageno’s Act 2 aria with his magic bells where again the viola feels quite apt in capturing its character. The Suite opens with the exposition of the overture and closes with a final duet where Papageno encounters the true love of his life, not Pamina but his very own Papagena. It is easy to underestimate today just how hard it must have been for a 19th century composer to contribute to one of the many musical genres — sonata, symphony, quartet — that Beethoven had made his own. In his now famous study of the stresses that accompany young creative minds working in the shadow of great forebears, the American literary critic Harold Bloom invented the phrase ‘the anxiety of influence’, and it seems an especially apt phrase here. Unable to evade his legacy, the generation which followed Beethoven could only overcome it by directly confronting those works which were the principal source of their anxiety, and, ultimately, as Bloom would term it, creatively ‘misread’ them. Born in Hamburg in 1809, Mendelssohn had been raised in a highly sophisticated musical and cultural environment, and had mastered the technical aspects of composing for string ensemble at a precociously young age. There is no doubt, then, that by his late teenage years he would have been fully aware of the cultural force of Beethoven’s music; he would have known that all new music was now to be composed, as one commentator has put it, ‘in the future perfect tense’. It was no longer enough to be concerned, as Mozart had been, principally with how one’s contemporaries might view one’s music. A composer now had to consider how such music would eventually be compared against a canon of earlier masterworks, a canon now dominated by Beethoven. For Mendelssohn, this meant confronting Beethoven’s most formidable music legacy — his so-called ‘late’ quartets, and this, his second quartet, is the most conspicuous result. It was composed in the year of Beethoven’s death (1827), while Mendelssohn was studying at the University of Berlin. The quartet pays homage to Beethoven in various ways. It opens with a chorale-like quotation of a melody taken from an earlier song by Mendelssohn (from his ‘Twelve Lieder’ Op.9, No.1) entitled ‘Ist es wahr?’ (‘Is it true?’), and thus unavoidably evokes the last movement of Beethoven’s last Quartet, Op.135, which itself carries the inscription ‘Muss es sein?’ (‘Must it be?’). Furthermore, this theme is itself strikingly reminiscent of the opening of Beethoven’s String Quartet Op.132. The second movement opens with a haunting melody which, like the Intermezzo which follows, at first evokes the post-Beethovenian world of the piano miniature: music that is propelled more by poetically inspired lyricism than by internal motivic play. Its middle section, however, contains a contrapuntally elaborate fugue, which not only is based on the opening theme of the quartet, it inevitably calls forth the numerous examples of extended fugal passages in Beethoven’s late quartets. The use of thematic allusion across all four movements is itself another homage to Beethoven, who had pioneered this technique in works like his Symphony No.5, and Mendelssohn certainly hoped his audience would consider the quartet not so much as four separate movements but as a multi-movement whole. The quartet in fact closes with an explicit repeat of the opening material, extended through further quotation from ‘Ist es wahr?’. It is precisely this overarching romantic literary-poetic influence, however, that presents the greatest, and most creative, ‘misreading’ of Beethoven’s model. The scherzo section of the third movement Intermezzo, for instance, gives us not so much the expected rumbustious musical comedy as a window onto a romantic, ‘elfin-like’ fantasy world, one that Mendelssohn had already made his own in the Octet Op.20 and which would find perhaps its most famous expression in his incidental music to A Midsummer Night’s Dream, Op.61. And while the fourth movement might begin with the kind of instrumental recitative that irresistibly recalls the opening of the Finale of Beethoven’s Ninth Symphony, here there is no Beethovenian attempt to address all humanity, rather we are presented with a quintessentially 19th century mood of romantic introspection. If this difference was in any doubt, we need only note that the quotation from ‘Ist es wahr?’ with which the work closes originally accompanied the lines (‘Was ich fühle, das begreift nur, die es mitfühlt, und die treu mir ewig bleibt’) (‘What I feel is only understood by her who feels with me and who remains always faithful to me’).